the Institut de la Vie invites man to grow. This english content is a view of the Institut de la Vie and its activity. Lost amidst tens of billion of stars that constitute a galaxy, hundreds of billion of galaxies moving in the universe, a tiny point in the haze of stars, a planet, the Earth, was born four billion and a half years ago. On this planet, of the same nature as the immense cosmos, life appeared four billion years ago, and evolved during forty million centuries. The human being is the last born. Then came the slow discovery, by the human mind of the universe and the self. During its brief history, man has already won his struggle against the hostile universe, he has asserted his power over inanimate matter and the living kingdom, he has renewed his concepts of himself and the cosmos; never was his situation so prosperous, nor was it ever so precarious. For, victorious over all his enemies, he is now confronting himself. Maintaining, transmitting life, such is the humble lesson of the bacterium, the worm and the reed. Is man, a superior form, going to ignore this elementary wisdom of primitive forms? Is he going to use freedom the supreme acquisition of life, to turn it against himself? Thus spoke Paul Valery. Since men have been me, the wind has risen and they have tried to live. They have tried to live, and did live, since we are here – alive – the present rings in a long chain of generations, come from bottomless and <ho, ring after ring should go on indefinitely. Because life is the most precious good, because we are getting more acutely a<are of its value, because the wish to live and to blossom out is in the hearts of all peoples of the Earth, the theme of life has become a major one. The theme of science, which is drastically changing human condition by giving man boundless power also seems to be a major theme. Establishes a flow of exchanges between men at all levels to make them aware of the value of life and educate them to make them respect it. We must understand the universe that surrounds us and with some of the best brains of the time, ponder on the mechanisms of life. We must make science serve human life, from the first encounter of the spermatozoid and the ovum from the first cry in the cradle to the last breath. And new fields are continually opening up to its action : protection of the genetic inheritance against mutagenic and carcinogenic chemical agents in the environment, so that man remains man, prevention of congenital abnormalities and mental retardation, global warming, fight against the parasitical diseases that affect 80% of Third World inhabitants, AIDS, tropical biology, preservation of the diversity of species, improvement of the habitat, growth control, aging : a challenge for science and social policy, needs and resources : towards a plan of actions for mankind (economy, energy, pollution, mineral resources, global systems models), man and computer, the consequences of scientific and technical breakthroughs for man and society, the problem of ends. Thanks to the Prizes of the Institut de la Vie we wish to induce people to love life, to defend it and make it blossom out. Through a great diplomatic action, we wish to establish the Institut de la Vie on an independent and universal institutional base. We wish to give Heads of States the historic opportunity of offering life to men’s hope for the world salvation, a politically new idea. The unity of knowledge, the unity of humankind, the defense and illustration of the highest values, such is the immense design of the Institut de la Vie, to open up to life the fabulous future it is destined to. The Institut de la Vie celebrates life in its splendor and munificence. It is an act of trust in the greatness of man and an act of faith. Life intrudes into all great international debates; it will cause a dramatic shift in the orientation of the policies of nations. I am a biologist. The biologist every day has an appointment with life en his laboratory. He is filled with the passion to know it. He is never disappointed when under his sight new aspects of creation are unveiled. At the very rare instant of the thrill of discovery, he is always dazzled by the splendor of the order and the majesty of the laws of the universe and the living world. Dazzled and then overcome with respect. After such a vision his will is keener not to let man wreck and destroy life for which he is now accountable. I love life and life is worthloving. 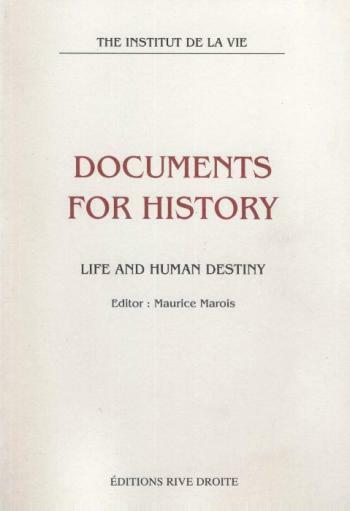 Maurice MAROIS, Documents for History, éditions Rive Droite. “For more than one third of a century, the Institut de la Vie has been observing the course of our own history. Anxious, with a soul scared by the suffering of the world but also filled with hope when the chaotic adventure opens up on happy promises, when tumult gives way to its fight sovereign life asserts itself in its power and splendor. We too are “children of the century”, but what a century! A century dominated by the power of men, still in their prehistory, that they give themselves through science and who must necessarily educate their freedom, master their passions, return to the springs of eternal wisdoms, and be inspired by them to forge a renewed wisdom. In front of situations they have never known, they must confront huge challenges not with bare hands as travelers without luggage, but enriched with all experiences, filled with all its expectations, as adults at last, determined to accomplish man’s humanity. In the tumult of the end of our millennium, every one perceives the expectation of a new “renaissance”, of the advent of a time when the value of life and the greatness of man would be acknowledged, man in the full exercise of his responsible freedom, man, spark of spirit, creature of love. We call for reconciliation of man with his full being. Not as a ebble carried away by the torrent, but as an actor and subject of history, man with intact purity in the deepest mystery of a conscience. There is human condition, and it is the same misery and the same greatness, there is anguish, and it is the same wreckage, there is failure and it is the same sadness, there is evil and it is the same abyss, there is death and it is the same vertigo. But there is life and it is the same bedazzlement, there is the future and it is the same chance, and the same peril, there is intelligence and it is the same light, there is freedom and it is hope and it is the same surge, there is tenderness and it is the same masterpiece, there is love and it is the same fulfillment. Listen to the moan of life who wants to live. Hear the call of the millennia to come. We, men of the XXth Century, are aware of the signs of the times. Science enriches our vision of the universe, of life and of man. It testifies to the greatness of the human mind. But knowledge is power. And carried by the tide of contemporary history, men have acquired through science, a power without limits. At this critical moment, destiny falters. We reject the pessimistic viewpoint which considers any civilization as mortal. Power of expression must be given to irrepressible hope. We have created great civilizations. The fact that their triumphs are but partial only accentuates our keen desire to accomplish that which remains unaccomplished. Their further achievements must give, to an even greater degree, full rights to the passionate claim of life which wants to live and develop. We assert our attachment to human life. This assertion cannot be dissociated from the proclamation of the highest values which give life a purpose and a sense. We would like to reach the essential purpose, that is to say life itself, the immediate truth, a simple and undeniable principle, the greatest possession, agent of unity, sole treasure of the living world. And to say “my country “ is not only a statement of earthly and national existence, it is to say “life”. This message, in its aim, is historic. It is a call for a new approach. If science revolutionizes humanity, we at least hope to control it in the service of life. Applied to the upholding of life, science is a liberator, warding off ancient fatalities and lessening the weight of suffering. In the name of all men on earth whose common aim is the will to live, in our name, and in the name of human tenderness, we celebrate life, we propose it as our major challenge today and for the millions of centuries to come. Suggestions for improving existing programs and undertaking new ones. Humankind pursues its course in an unstable world, where the exponential increase in knowledge may have either beneficial or dangerous applications. As a result the scientific community – no< more than ever conscious of the ambivalence of science – has become permanently alert to its possible consequences. The Institut de la Vie is a center for reflection and action. Its mission is to proclaim the value of life, to discover how the results of science may be put to the best possible uses in the service and development of humanity and safeguarding of humankind’s natural environment. The Institut de la Vie has therefore chosen three main themes : science as the evidence of the greatness of mind ; science as an influence for good ; science, power and wisdom. Founded in 1960 in Paris on the initiative of Professor Maurice Marois with the participation of men of thought and action from a variety of backgrounds, with the support of scholarly circles and the help of philanthropic foundations, the Institut de la Vie has convened numerous international conferences on varied subjects : theoretical physics, biology, computer science, economics energy, pollution, global medelling, human settlements, protection against environmental mutagens and carcinogens, prevention of congenital physical and mental defects, aging, parasitic diseases, tropical biology, preservation of biological diversity. More than three thousand scientists from sixty countries – among them fifty Nobel Prize winners – have participated in these meetings, testifying to the high standard of participants the institution has attracted to the service of its ideal. The choice of themes and of ways of dealing with them was inspired by the same guiding thought ; to reduce, through interdisciplinary and transdisciplinary methods, the fragmentation of knowledge, to abolish cultural, geographical and political barriers, to harmonize into a single vision science and civilization, and respect, defense and fulfillment of life. From its beginnings, the Institut de la Vie has led to the creation outside of France of national committees, notably in Switzerland, Belgium, Canada, Lebanon, Finland, the United States of America, Spain, and Poland. Since 1975, having acquired a large audience thanks to its conferences and to the inclusion of well-known personalities on its Prize juries, the Institut de la Vie has created its own international institutions. In 1976, the World Council of Directors was established, composed of scientists of high repute from the main countries interested in its work. In 1977, the World Foundation and the World Agency were created in Geneva. The World Foundation collects and manages the Institut’s funds ; the World Agency concludes agreements with governments or institutions for their support of and participation in the activities of the Institut in an international framework. The Institut de la Vie intends to go on studying the subjects it has dealt with up to now: they are of permanent interest. It will implement in the near future a program of objective overviews, for the largest possible audience, on scientific knowledge and the consequences of its application. It is ready to face any new challenge that might confront mankind. To establish a flow of exchanges between men on all levels so as to make them aware of the value of life in order to respect it. To initiate actions in the service of humankind, in respect of its dignity, and diversity of its cultures. Maurice Marois, In “Les Dilemmes du réchauffement de la Terre”, Deauville 1990. Nobel Prize winner, Member of the National Academy of Sciences of the United States Professor of Physics. The summit in Geneva and subsequent developments give rise to Herat hopes for humanity. At this historic moment we feel that it is important to emphasize life, the radiant face of peace. Life is a theme that is politically new, universal, unifying, dynamizing and open to the future: we have been created not do die but to live. The Institut de la Vie has acquired a universal diplomatic trust, from North to South and from East to West. Its message to the Earth’s Heads of States and of Governments was greeted by forty-five responses, including those of the United states and the soviet Union. During the ceremony that marked its twentieth anniversary that were presided by the President of the Swiss Confederation, the Institut de la Vie launched before two thousand persons from twenty-two countries including five Nobel Prize laureates, an appeal for a joint action by the highest responsible political leader and science in support of life. Science, education, television and man’s future. The material effort that will be needed will be very modest by comparison with the expected benefits. In order to lend contents to these, programs the Institut de la Vie will organize in Geneva in several weeks, before the new summit, a conference on “Science in the Service of Life : Global Problems”, the majority of whose members will be drawn from men of science of the United States and the Soviet Union. The results of their work will be immediately submitted, in the form of a general report, to the consideration of the Heads of States of the Earth’s two most powerful nations. Do you consider the proclamation of life and particularly of human life, as the highest stake, to be biological, philosophically, and politically our age’s primary task? In order to achieve a peaceful organization of the world and a flowering of entire man and of all men are you prepared to incorporate the contribution of “Science in the service of Life” in the prospectus for cooperation and meetings between the two superpowers and international cooperation? Are you disposed to receive propositions relating to programs, whose elaboration the Institut de la Vie will complete during a forthcoming international scientific conference, a majority of whose participants will be scientists from the two superpowers? Within the Institut de la Vie science has chosen to enhance life’s chances. We refuse to endorse the tragic affirmation of “a human history written by a mad God”. If history is only what it is, then indeed despair ma fill the world’s soul. We reject realism without horizon. We reject resignation. It will not be said that man failed to find solutions to problems that he has himself created. We are frightened by the dimensions of the forces of misfortune. Life has installed itself on Earth. Its policy is to remain there. Through a free initiative we wish to institute it again not only through a perpetuation of instinct but through a decision of the mind and the heart. Is it too ambitious to hope that a few witnesses will incarnate the will to live, the taste for life, and the joy of life, that a few men o science at the highest level of lucid reflection may emerge as a fine point of creative and constructive thought, that a few men of faith possessing an intemporal vision may proclaim hope, and that a few great political leaders may accomplish, already today, here and now, the prophetic revolution of human happiness in the fullness of life? Our motherland is not only national and earthly. It is life. “On behalf of all men on Earth who share a will to live, on our own behalf, on behalf of human tenderness, we celebrate life and we propose it as the major stake both today and during millions of centuries to come” (extract from our message to Heads of States and of Governments). I have the honor, Mr. President, (or Mr. Secretary General) to ask you to accept my very high esteem. I read with great interest the letter you were kind enough to send me at the same time as to President Reagan. I thank you for your information on the activities of the Institut de la Vie and on its projects. Reading your correspondence it is obvious that this Institut deals with very exciting problems of today which definitely rise concern – on way or another – for any reasonable human being wherever his country of residence, his ideology or his political ideas. Food resources and nutrition, environment and the vegetal and animal kingdom, ethics and biological medicine, science, education, television and the future of mankind, all spin-off of modern technology impacting on human life, are as many problems, as those addressed by the Institute which weigh upon us from life itself and which urgent, sometimes serious and hot character increases continuously as time goes on. It may be that, today, some people still do not understand that situation, but it is pretty sure that tomorrow, at the rim of the third millenary, everyone will feel it and fully appraise the issue. To that question, I would be inclined to answer by “yes, definitely yes”, without comment. However I would like to add the following: the problem you address has been of deep concern for the best brains of mankind since, probably, the remote times where humans did generate their first thinkers. Even today, in this nuclear era which is ours, it has reached new dimensions and appears under a different light. Fiodor Dostoievski wrote, in his time, quite close to us indeed in historical scale, “The enigma of the human condition is not to live, but, in fact, to know what are we living for”. Should we think it over, this formula – which, by the way, I would not object – has today in the atomic era, a new significance, I would say, that in our present time, life is worthwhile being lived if we make use of it to protect and save life itself on Earth. There is no more important target. Never before, in its history, mankind did face such a major challenge. And, now in front of us this problem rises, cruel and merciless, in all its wilderness, in real down to Earth dimensions. No one can wipe it out and get rid of it since everyone and all of us are involved. This being said, I am convinced that it should be solved thanks to the joint efforts of our present generation. Either, in a forecastable future we are able to find an appropriate solution and eradicate from the life of our children and great children the terrible burden of an existence which is lived under the permanent threat of an almost instantaneous potential destruction of mankind. Either we fail and, in that particular case, even if the most dreadful issues can be avoided, it will be unbelievably difficult, if not impossible to reach a solution. The armament race has already brought mankind to a critical level beyond which one can wonder whether man will be able or not to control the situation, knowing the technical performances of new advanced land and space weaponry. Once this limit is crossed, life on Earth will be hanged by one single wire which can rupture any time. It is quite evident that, in order to survive, we need to live and act otherwise, in a new way. This applies in the first place, to coexistence between States. Indeed it is from those relationships that international life derives its “anatomy” and “physiology”. Relationship between States can only be based on mutual respect of respective interest, essentially security, and should be guaranteed by material, political, legal, moral and psychological instruments and result in a close cooperation to develop means to save life and settle a large set of global problems which condition the quality of said life. In other words, this past ‘international) order which dealt with national security only through technical and military means and by brute force, that order which made our world a hostage of the nuclear death, that particular order, indeed, should be replaced by a universal security system merging together all the different spheres of international relationship. Mankind may – and should – live in good harmony with nature, but, in order to succeed, mankind should first be in harmony with itself. It is precisely along those lines that this problem has been addressed at the 27th Congress of the Communist Party of Soviet Union. Before anything else, may I stress that we have never claimed in the past – and are not driving at claiming it today – to play a “superpower role. Moreover, we strongly feel that nobody should be driving at assuming such a role should we wish to rebuild a new and efficient international life and preserve life on our planet. Modern sciences and techniques give us the opportunity to improve the beauty of life on Earth – in its real meaning – as well as to collect the necessary conditions for a harmonious development of everyone’s personality. However, the nature of things is such that the same intelligence and efforts of men can also challenge the very existence of mankind. What a dreadful contradiction! We solemnly claim that science should not service two masters, life and death, but should only sustain life. In their very nature, the ideas incorporated in the program “Science to the Service of Life” are such that in order to reach a good solution, they request the pooling of the efforts of both Soviet Union and United States, as well as of mankind as a whole. We are quite ready to consider these propositions and make use of them – as a function of their nature – in the field of concrete politics. Wishing you every success in your activities, I remain, Dear Professor, yours very sincerely. I greatly appreciate your consideration in writing to inform me of your proposed conference on « Science at the Service of Life: Global Problems ». I applaud your efforts to advance the cause of a just and lasting peace. Last October, before the United Nations General Assembly, I said: “There is no purpose more noble than for us to sustain and celebrate life in a turbulent world. And that is what we must do now. We have no higher duty, no greater cause as humans. Life – and the preservation of freedom to live it in dignity – is what we are on this earth to do.” The United States commitment to preserving life and enhancing the quality of life throughout the world is fundamental to the very existence initiatives of the Institut de la Vie toward these goals. The United States has made clear many times its willingness to support scientific cooperation in pursuit of the enhancement of the quality of life in the world. We have always welcomed the prospect of international cooperation in furthering peace and understanding, and we continue to welcome all proposals which advance these interests. Enduring peace requires openness, honest communications and opportunities for the American and Soviet peoples to get to know one another directly in order for us to pursue the many avenues where we can cooperate fruitfully for the benefit of mankind. At the conclusion of my discussions with General Secretary Gorbatchev in Geneva last November, the United States and the Soviet Union signed a General Exchanges Agreement, in which we commit ourselves to addressing common problems through the expansion of bilateral programs for sharing expertise, data and resources in education, medicine, law, radio and television. We have much to learn from each other. The U.S. Soviet Exchanges Agreement augments a number of scientific cooperation agreements previously established by the United States and the Soviet Union. These include agreements in agriculture, medical science and public health, artificial heart research and development, atomic energy, environmental protection, world oceans, and housing construction. There are also numerous private scientific exchange programs, many of which are facilitated by our two Governments. I want expanded contacts between the United States and the Soviet Union wherever there is mutual interest, and remain convinced that peace will be found only through debate, discussion and cooperation. In spite of youthful accomplishments and initial interest in the humanities, Maurice Marois was attracted by admiration for his physician father into a career in medicine. Today, Mr. Chancellor, Maurice Marois is a distinguished man of science with most of the visible signs of success that a superlative career in science can bring: scores of publications in the general field of reproductive endocrinology and physiology; pioneer in the use of radioisotopes in biology ; winner of the Montyon, Janssen and Chateauvillard Prizes before he was thirty ; recipient of the Médaille d’or Albert Schweitzer; Professor of Histology in the University of Paris for nearly thirty years; President of the Society of Thanatology; Chevalier de la Légion d’Honneur. This long, distinguished and still active career in Science and Medicine as teacher and researcher would command the attention of the most fastidious selection committee for an Honorary Degree. Yet the accomplishments are incidental to his presence here today, a scion of the pedigree of Antoine Lavoisier, Jules Henri Poincaré, Claude Bernard, Louis Pasteur, Maurice Marois the scientist has embraced Maurice Marois the humanist, acknowledging the maxim of his great countryman François Rabelais, that “science sans conscience n’est que ruine de l’âme”. Seized by the simple and perhaps obvious conviction that science, as one of the highest forms of human activity, ought to serve humanity, that science and its application are bound together as the fruit to the tree that bears it, he founded in 1960 the network of scientists and intellectuals known as l’Institut de la Vie. He has described himself, Mr. Chancellor, as a mere agent, but he is “un intrument de la vision de François 1er”, who founded the Collège de France in the sixteenth century. Quiet, modest, and unassuming, Maurice Marois is nevertheless a persuasive and passionate soul who has worked tirelessly to give visible and palpable effect to the principle which drives him. His eloquence and dedication, together with his own scientific credentials, have combined to engage the attention of the leading scientists of the world, including a galaxy of Nobel laureates. His well-organized, quiet and select conferences under the general title “From Theoretical Physics to Biology”, bring together in alternate years at Versailles some of the finest minds in the world in order to deal with solutions to global problems. He has reminded scientists that the same science which has produced the atom bomb, agent orange, and gas warfare, can also produce penicillin, the contraceptive pill and organ transplants. The same science which serves the dark side of humanity can also liberate the spirit, pointing mankind towards the stars and beyond. A visionary? Yes, certainly that. But also a highly pragmatic man of action. Recognizing that if the principles espoused by l’Institut de la Vie are to influence society, he has focused his persuasive energy on the political leaders of the world. Presidents and Prime Ministers have felt the influence of his reason and his passion. 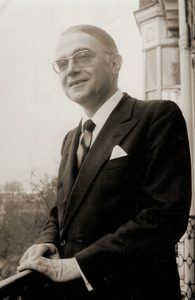 He has engaged in direct and persuasive correspondence with both President Reagan and Secretary Gorbatchev, and with their agreement, he has convened meetings of some of the leading scientists of the world in order to establish a scientific agenda for the summit meetings, an agenda which identifies those important problems of mankind which are susceptible to scientific solutions. The fact that these are familiar problems: global atmospheric change, the loss of genetic diversity, does not lessen the force of their identification for the most important political meetings of our time. Mr. Chancellor, York is proud to have enjoyed a long association with l’Institut de la Vie, an association which has continued to grow and intensify so that York University is now the Canadian centre for l’Institut de la Vie, where among other inquiries, the International Committee on the Protection of the Environment against Mutagens and Carcinogens will provide a forum at the university for scientists and researchers to study poisons, diseases, and their impact on the environment. Maurice Marois has devoted his career to a fulfillment of Einstein’s wish that the “creation of our mind shall be a blessing and not a curse to mankind”. York University shares with l’Institut de la Vie a conviction that Science must reach beyond the laboratory to serve the humanity which has created it. We are honored to present to you the founder of l’Institut de la Vie, Professor Maurice Marois, physician, teacher, scientist, warrior, visionary and humanitarian, so that you may confer on him the degree of Doctor of Science, honoris causa. Speech of M. Maurice MAROIS, who received this degree. The heroic adventure of life has been developing for more than three billion years. The earth might continue to be habitable for another six billion years. Man is the latest off spring. Each human being is unique and thus irreplaceable. With the appearance of the human species, brain organization, intelligence and spirit reveal their splendor. Life becomes aware of itself, liberty rises up. From liberty comes responsibility : towards ourselves, towards our descendants, towards the entire living world. Such a man is capable, of inventing moral precepts, of loving and of contemplating such a man achieves the fullness of his humanity only when he achieves his dignity and his rights and when he accomplishes his duties. It is our good fortune to have been invited into the lonely isolation of the garden of earth in an immense inhospitable cosmos. But today, our air, the water of our streams and lakes, ours oceans, our soils, our renewable and non-renewable resources, the natural equilibria of the world, the fauna and flora, our physical, biological, social and cultural environments are seriously jeopardized. The planet is suffering the consequences of acid rain, ozone depletion, widespread desertification, global warming, and loss of species. The worldwide use of fossil fuels, is leading to a steady accumulation of carbon dioxide in the atmosphere which causes warming of world temperatures leading to rise in sea level which may amount to sixty centimeters or about two feet in a century. That rise in the sea level would flood homes of millions of people. The genes of the living world cannot be replaced or renewed. They are all of an immense value for future generations. They have developed and diversified over three billion years. They are eroding. The rate of extinctions has grown to the point that today, species of living beings are disappearing so fast that at least one fifth of all living species, plants, animals and smaller forms, will vanish under our assaults during the next thirty years. The quality of human life is also closely linked to cultural values and to the human wisdom which is often encoded in philosophies, in religions, in laws. Creations of the human spirit : art, architecture, painting, sculpture, prose, poetry and music are priceless. But man is careless and improvident. For example, the marble treasures of the Acropolis of Athens and the brilliant medieval and renaissance architectural and sculptural monuments are rapidly eroding under the pressure of industrial pollution. I stop this enumeration here. I am a biologist. The biologist has a daily appointment with life and is filled with passion for understanding life. He is never disappointed when under his gaze; new aspects are brought to light. Always at rare instants of the startling discovery, he is amazed by the splendors of the order and the majesty of the laws of the universe and of the living world. He is amaze, and then filled with respect. After such a vision, the will is strengthened to prevent man from running and destroying the life for which he is accountable. That is why I have founded the Institut de la Vie. The Institut de la Vie is a scientific and ethical institution. It represents the mind which inquires and the conscience which deliberates. We must save life and the resources on which life depends. We must proclaim the value of life, encourage the use of science for the service of life and enlist all mankind and all governments in their responsibilities towards life and especially towards human life. This program has been sent to all the chiefs of state or government of the earth. Necessity imposes the construction of a welcoming structure for the world which comes, to go beyond history, in order to outrun it so that the values experienced as permanent and universal may survive the collapse of the obsolete world that produced them. A species organ is required. It would analyze all the potentialities of the future by confronting them with the permanent aspirations and demands of individual man, both temporal and intemporal. It would help men to proceed at every moment, freely and knowingly, to make the decisive choices, that commit their present and their future. The Institut de la Vie will establish a “World Center of Human Destiny”. As an integrating organ at the level of the whole human species, it would neglect nothing of the richness of the past, would search the potentialities of the future and confront them with the permanent and aspirations of man in all his dimensions. It would analyze the situation of life on earth with the exactness of science. It would ponder over the mastery of change, over the management of the complex and the unpredictable and over a strategy of life. It would start giving careful thought to the human condition, to the reasons for living and to the meaning of life. Life is information, structure, organization, hierarchy: it expresses itself. It is dynamic balance, regulation, adaptation, obstinacy: it perseveres. It is project, motion, emergence : it conquers. That is the wisdom of nature. But owing to the tragedy of scarcity and limitation, life is pursuing its way along a path of death. Human wisdom tries to overcome this bloody rigor by proclaiming the demands of our moral conscience. The Institut de la Vie is not only the institute of the living cell; it is the institute of the reasons which make life worth living. When the motivations for living are engulfed into noise, fury and tears, then despair overwhelms the soul of the world and disaster threatens not only “l’homme aux semelles de vent” selon la formule d’un poète français, the “wind-soled” individual but the whole species. That is why, since its first beginning, the Institut de la Vie has risen against the great tragic voices of our time which celebrate misfortune, sing despair, proclaim death and invite to nothingness. Each man possesses a parcel of life expectation, a frail spark. All these sparks may be gathered into a huge fire. The Institut de la Vie proposes the awareness of the value and beauty of life. Let us hope that we will soon be able to proclaim the tremendous good news that from this moment life is not threatened but on the contrary – since ma always surpasses himself – he may look forward to a fabulous blossoming. Our message is a plea for life. It is an appeal to the unity and solidarity of the human community. The Institut de la Vie is not merely an organ for research and action which seeks to be realistic, dedicated to concrete and useful efficient work. It is a song, the song of man who sends up to the stars his questioning about the meaning of his life, who projects his hope towards a future richer in justice, in fraternity, and in love. It is the assertion of the human being in the greatness of his intelligence, his freedom and the autonomy of his will. It is the song of the world in the majesty of its laws, beyond the ancient chaos, in its harmony beyond the dissonances, in its duration despite History’s crises. If the suit that science has tailored for man hangs loosely the Institut de la Vie invites man to grow up. A dust lost in the ocean of matter, time and space, clinging to the side of an ephemeral planet in the dust-haze of the immense cosmos, but a living, thinking, acting, suffering, loving dust which hopes, such is man, life’s last-born, a spark of spirit, a parcel of knowledge, pain and joy, “a tortured victim who is burning and signaling from his stake”, according to Antonin Artaud’s phrase, “a spectra under his woolen cloak and his big stranger’s felt hat” according to Saint-John-Perse, coming we know not where from, going we know not whereto, tragic or burlesque, pathetic or ridiculous, but of a dimension incommensurable with immensity, endowed with a spirit more luminous than the brilliance of a thousand suns, with a heart richer than all the riches of the universe, with a love greater than life’s impetus. Listen to the moan of life, who wants to live, hear the call of the millennia to come, be attentive to the germination of a new world: soon the buds will open out. On behalf of all men on earth who share a will to live, on our own behalf, on behalf of “human tenderness” we celebrate life and we propose it as the major stake both today and during millions of centuries to come. Mankind knows that its expansion will find its limits. Mankind knows that it is mortal and from a death that it can give itself. It is acquiring the power to act upon life to alter its form and to change man. Scientific breakthroughs offer the fabulous perspectives of the unheard-off. Science does give man boundless power. Carried to its utmost logic it compels us to pose the problem of ends. It also compels us to reject, lest we perish, the philosophies of suspicion or despair. A famous sentence is written under Gauguin’s painting : “Who are we, where do we come from, where are we going to ?” What is the meaning of our life ? What is the vocation of man ? How can we cope with all the new challenges which every day confront mankind ? Some of these questions, that everybody asks, have no answer. It is not a reason for not asking them. This text, as such, may seem to you too short. I find it still too long. Here is a historic memory. François 1er, King of France in the sixteenth century, came back from the wars in Italy. Fascinated by the Renaissance, he asked a famous humanist of his time, Guillaume Budé : “How to cope with the Sorbonne where an awful scholastic prevailed, extinguishing the creative spirit ? Advised by Erasmus, Guillaume Budé answered in one word : “Knowledge”. Such was the origin of the College de France. One word was enough. The project is ambitious, necessary, possible. Ambitious: supreme audacity is supreme realism. Necessary: life gives us the example of integration at different levels of organization. There is no organ of integration for the entire human species. Sooner or later this organ will come into existence. Let us go faster than history to give it a better shape. Possible: one of the reasons is the credibility of the Institut de la Vie : the institution which we have been building for thirty years can sustain the greatest designs. It has convened numerous international conferences on varied subjects : theoretical physics, biology, computer science, economics, energy, pollution, global modeling, human settlements, protection against environmental mutagens and carcinogens, prevention of congenital physical and mental defects, aging, parasitic diseases, tropical biology, preservation of biological diversity, biomedical research strategy on AIDS. More than three thousands scientists from sixty countries – among them fifty Nobel Prize-winners – have participated in these meeting. The choice of themes and of ways of dealing with them was inspired by the same guiding thought : to reduce, through interdisciplinary methods, the fragmentation of knowledge, to abolish cultural, geographical and political barriers, to harmonize into a single vision science and civilization and respect, defense and fulfillement of life. At the stage of development our institution has reached, the time seems to have come to crown it by a “World Center on Human Destiny” which will give it its true justification and will help to light its way. There, one could deal with questions that do not always have their place in the scientific conferences of the Institut de la Vie. It is useful to distinguish the word destiny form the word fate. We suffer fate like a kind of inexorable blind fatality. Destiny is a more reassuring term because it make us feel that our own history is not vain. If its ultimate meaning could be revealed – which will never completely be – our itinerary will be safer. I am proud of having been Assistant Director at the College de France. I admire this institution for its independence, its flexibility, its vast field of vision, its selectivity. Independence because it is a self perpetuating institution. Flexibility : for instance, the are no great botanists in France today and therefore there is no chair of botany. If new disciplines appear, chairs of artificial radioactivity or molecular biology are created. A vast field of vision, from Sanskrit to philosophy, from literature to art history and to the most advanced sciences. Selectivity : I mean the choice of the best people. The limits of this beautiful institution seem to be the limitation to one country (France), the rarity of interfaces between various disciplines, and perhaps a kind of slowness of renewal. We propose for the “World Center on Human Destiny” to keep independence, flexibility, the vast field of vision, the choice of the best people. Against limitation, we propose to call upon all collaborations whatever the nationality can be; against the absence of interfaces, inter and transdisciplinarity ; against the slowness of the turnover, the ceaseless renewal of collaborations. The problems would not be treated in authoritative courses but in international congresses, symposia or seminars. On controversial subjects, confrontations would be organized between conflicting points of views in an atmosphere of serene freedom. Everything will be published objectively and distributed or broadcasted by all modern means, without indoctrinating. The institution will refuse to be normative. It will modestly attempt to be a laboratory of wisdom in search of itself. How can we ensure permanency in movement? Permanency: a committee of wise persons will recruit itself by coopting each other according to criteria of competence, rigor, lucidity, generosity and a sense of fundamental values. Movement: this committee chooses the themes some of them eternal because they correspond to human constants ; others concerning new challenges of the tumultuous history of human beings. By attempting to achieve the great scheme of the “World Center on Human Destiny”, we are faithful to what the Institut de la Vie would like to be : the Institut de la Vie is not merely an organ for research and action which seeks to be realistic, dedicated to concrete and useful efficient work. It is a song, the song of man who sends up t o the stars his questioning about the meaning of his life, who projects his hope towards a future richer in justice, in fraternity, and in love. It is the assertion of the human being in the greatness of his intelligence, his freedom and the autonomy of his will. It is the song of the world in the majesty of its laws, beyond the ancient chaos, in its harmony beyond the dissonances, in its duration despite History’s crises. If the suit that science has tailored for man hangs loosely, the Institut de la Vie invites man to grow up. A dust lost in the ocean of matter, time and space, time and space, clinging to the side of an ephemeral planet in the dust-hase of the immense cosmos, but a living, thinking, acting, suffering, loving dust which hopes, such is man, life’s last-born, a spark of spirit, a parcel of knowledge, pain and joy, “a tortured victim who is burning and signaling from his stake”, according to Antonin Arthaud’s phrase, “a spectra under his woolen cloak and his big stranger’s felt hat” according to Saint-John Perse, coming we know not where from, going we know not whereto, tragic or burlesque, pathetic or ridiculous, but of a dimension incommensurable with immensity, endowed with a spirit more luminous that the brilliance of a thousand suns, with a heart richer than all the riches of the universe, with a love greater than life’s impetus. “Where do we come from? Who are we? Where are we going to?” We come from the night of time, and each of us can hear the great bell of millenaries in his cells. We are as old as the universe as old as life. Who are we? A flash of conscience in which dwell inextinguishable love and hope. Where are we going to? I don’t have the answer. It is within the realm of resignation, hope or incantation. But an effort of reflection could give us a better long range vision. Abraham Lincoln has written: “Man is a family”. That is true. We can add today: the Earth is a village. Life is our common good. We want to live and live like human beings. These terms being understood in their fullest sense. That is why we are here today. A cathedral of the spirit the Institut de la Vie World Center on Human Destiny might nurture our reflections in our search for meaning. It might also help to shod light on mankind strategic decisions and give a voice to the will to live and to hope. We seek to establish a Institut de la Vie World Center on Human Destiny. We are mindful of the global impact of growing technological powers that transform our life and also our world, now become increasingly small and interdependent. We are concerned about the prospects and perils for our human posterity and its natural and social environments. We recognize the centrality and complexity of the moral and spiritual issues of human destiny raised by scientific advance and technological progress. We accept the fact of human responsibility for the shape of our own future and the fate of life on Earth. We wish to respond to the need for deep and searching inquiry into the human prospect. The Center, an international fellowship of scholars from all relevant disciplines and outlooks, will conduct serious, sustained, and forward-looking research and discussion, in search of wisdom regarding the most fundamental questions concerning the human prospect. In this quest for wisdom, we express the belief that we can – indeed, must – find much underlying commonality beneath the often conflicting beliefs and attitudes that now divide humankind. Show, where possible, why some answers would be better than others. Though we view our mission to be primarily work for thought, and though we eschew ideology and partisan political positions, we do believe that new and better ways of understanding may lead to new and better ways of acting. What is humankind’s relation to the rest of nature? What is the proper balance between use and conservation, alteration and appreciation, mastery and stewardship? To what in nature and for what are we responsible, and why? What kinds or habitats, social and natural, are and will be most conducive to human flourishing? What sorts of science and technology can contribute most to providing such habitats? How can the human habitat be better protected against the undesirable consequences of technological advance? How can we integrate the “objective” findings of science with “inner” knowledge of lived experience? How can we integrate value-neutral scientific knowledge with moral knowledge? Can we find a more adequate and comprehensive knowledge of our own common humanity? What are the prospects for directed alteration of the human body and mind, through techniques arising from genetics, neuro-psychology, aging research, and other biomedical sciences? What notions of health or human fitness should guide future interventions? What should be the goals of biomedical technology applied to human beings? What is the meaning of mortality, in the life of both individuals and communities? How far can we go in our efforts to postpone, or even “conquer” death? How far would it be wise to go? Does humankind have a special place? Does humankind have a special purpose? Can one reconcile the scientific findings with the (competing) religious and philosophical answers to these questions? What, despite our cultural differences, might be our shared human concerns and aspirations? What, despite our cultural differences, might be our shared attitudes and norms, especially in the face of the growing interconnectedness of our fate? Which notions of goodness and rightness are most needful? Howmight they be promoted? The Center will encourage research and organize conferences to address these and related fundamental issues, which are not generally and publicly addressed. The Center will be a centering locus of an international community of scholars, to facilitate collaborative research and exchange and to attract new scholarship to these pressing questions. The Center will provide public education about these issues. The Center will be a resource for the education of governmental agencies dealing with these issues. Open to the best thinking of all thought men and women.